check back often to stay up to date on our recent news. This is an environment requiring vigilance. While we expect volatility to continue near-term, it is important to remember that the last two episodes of similar volatility, 2011 and 2015-2016, proved to be long-term buying opportunities. A decade of consecutive, positive annual S&P 500 returns ended in 2018. In the final three months of the year, the index registered its worst quarterly performance in seven years, ending 2018 with a negative annual total return for the first time since 2008. Contrary to most of the headlines, the sharp declines in stocks were not directly driven by trade wars or ongoing political dramas, all of which were with us for the majority of 2018. Instead, the breakdown in stocks was driven by a perfect storm of underwhelming corporate earnings guidance, slowing economic growth and frustration with Federal Reserve monetary policy. While most companies beat consensus earnings estimates for the third quarter, profit warnings from select multinational and industrial firms such as PPG Industries (PPG) and FedEx (FDX) highlighted growing concerns about peak earnings growth for U.S. corporations. That rising concern was reflected by the market’s performance during the heart of the third-quarter reporting season, as the S&P 500 declined 6.84% in October. In early December, multiple economic indicators, including manufacturing surveys and the November jobs report, missed Wall Street consensus estimates. This added the potential of slowing economic growth to the list of headwinds on stocks. Later in December, the Fed increased interest rates for the fourth time in 2018, despite recent declines in stocks and wavering economic data, and further signaled two additional increases in 2019. That policy decision, more restrictive than investors were hoping for, caused stocks to plunge. The major equity indexes dropped to new 52-week lows during the final two weeks of December. Markets did bounce modestly during the final days of 2018, but finished solidly negative for the year. The fundamental drivers of the multi-year rise in stocks remain generally in place. Even so, investors experienced 2018 as a very difficult year. 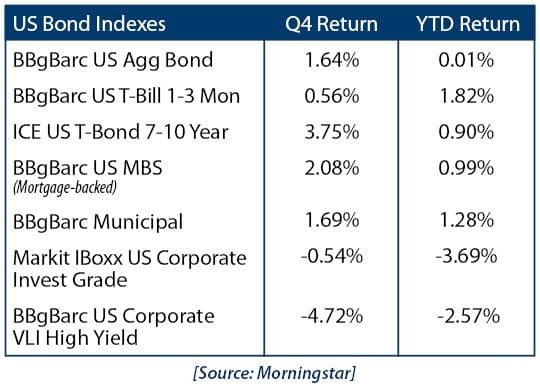 Not only did most major stock indices post a negative full-year total return for the first time since 2008, but the declines came with two episodes of intense, confidence-shaking volatility in the first and fourth quarters. Whether the markets continue recent declines, or rebound, will depend largely on the resolution of three uncertainties: earnings, economic growth and Fed policy. Investors began 2019 reeling from the worst quarter in years, with markets facing such headwinds as an uncertain outlook for corporate earnings, potentially slowing economic growth, and lack of clarity on Fed policy. These concerns have been at least partially acknowledged by the markets, as the major U.S. stock indices began 2019 more than 10% off their 2018 highs, and expectations have been reduced. We can expect volatility in stock, bond and commodity markets to continue. The bulk of fourth-quarter 2018 earnings results will be released in January, revealing whether U.S. corporate results have stabilized, or the disappointing Q3 guidance from some companies has continued. Investors will be focused on economic reports, including the December Employment Situation, ISM Manufacturing PMI, Retail Sales, and Core PCE Price Index, to determine whether U.S. economic growth has peaked, or merely slowed. year—a change that was announced before recent market volatility. This additional, regular communication should allow the chairman to communicate more effectively with investors, and potentially resolve uncertainty regarding Fed policy. We also begin 2019 watching several geopolitical situations. Hope remains that the U.S. and China will agree to reduce tariffs before the negotiation period expires. In Europe, negotiations among Britain’s largest political parties continue in an effort to approve an agreement with the European Union. History has shown that a long-term approach, combined with a well-designed and well-executed investment strategy, can overcome periods of heightened volatility, market corrections, and even bear markets. At Krilogy Financial, we are committed to helping you effectively navigate this challenging investment environment. Even intense volatility such as we experienced in the fourth quarter is unlikely to alter a diversified approach set up to meet your long-term investment goals. Please do not hesitate to contact us with any questions, comments, or to schedule a portfolio review.